Our digital team have been busy this season with plenty of photoshoots capturing our favourite installs in some fabulous outdoor living spaces across the country. Our aim is to gather stunning imagery that we can put forward to you and inspire you with. Our external shading and outdoor living products can really change the way you use your space and by capturing hi-res images we are able to highlight the benefits and aesthetic appeals our shading systems have. 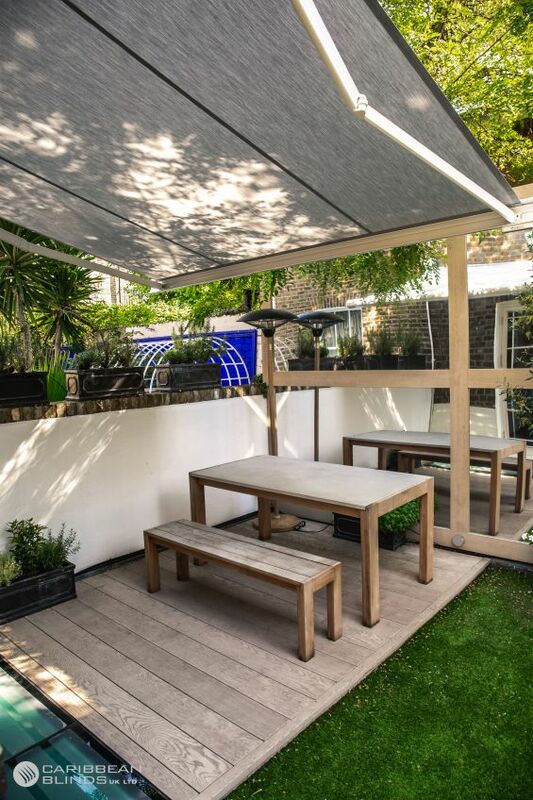 This month we visited our accommodating clients at their town house in Chelsea, London, as soon as we were escorted to their garden area we were taken back by the way that the clients had made use of the limited space they have. The garden was surrounded by greenery with large mirrors at the back to reflect light and colours, it also created the illusion of a larger space which is a great solution if you have a small area to work with. They used artificial grass and composite decking to keep it low maintenance with enough seating for the family to relax or socialise. 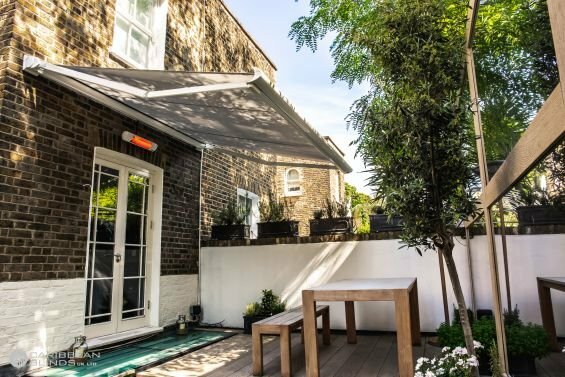 The limited outdoor living space was designed well that it did not make you feel claustrophobic, it was a neat cosy space that felt relaxing and homely. Our patio awning added the final touch to the client’s space. 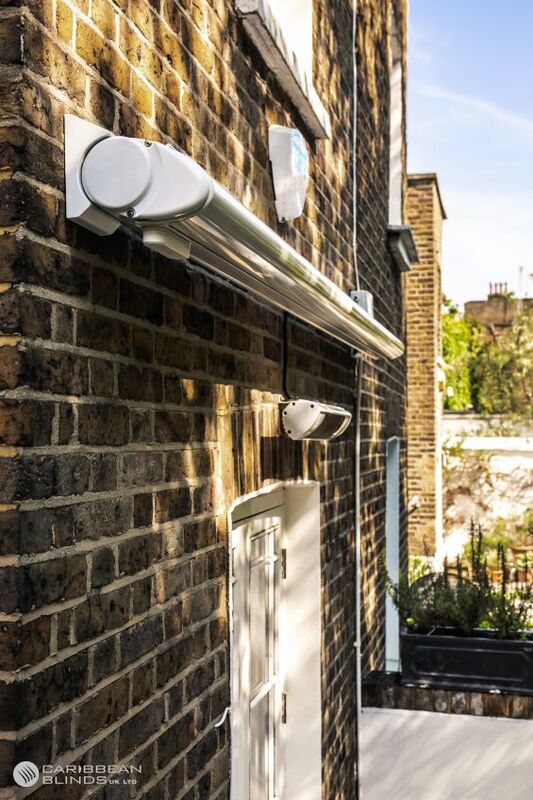 We powder coated the aluminium hardware to a white finish to match with the existing design features and it sits wonderfully against the London brick work. One of the advantages of applying a retractable awning in a space like this is that you are able to close the awning away in a compact robust cassette, a great space saving shading solution. The patio doors are directly linked to the kitchen which creates a smooth easy access transition to their alfresco space. The sun awning has a projection of 2.5 meters and it is in the ideal spot to create a shaded area over the dining space and the glass bottom floor when the sun is directly above. 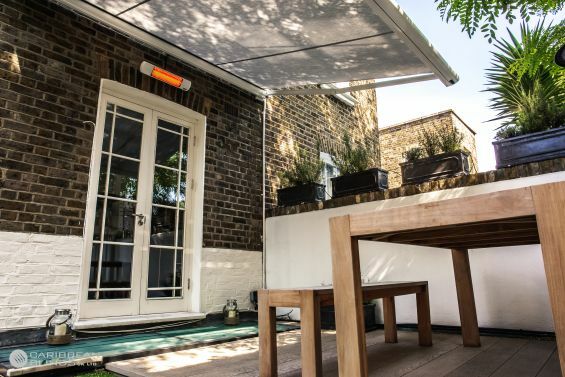 Outdoor awnings are a great dual purpose system, it can provide solar protection over glazed area and it is a luxurious outdoor living solution that can transform the way you use your garden space. 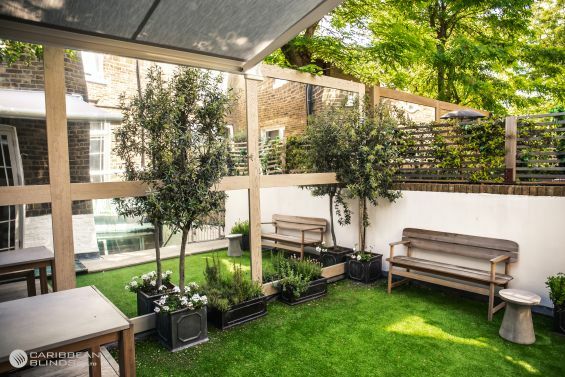 If you have a similar garden space to this magnificent Chelsea garden an you are looking to create a space that you can utilise then contact us today to discuss your design options, your garden could be the next one we photoshoot. You can leave your details using our quick enquiry form or you can call us on 0344 800 1947.